Apple on Tuesday unveiled a new 27-inch LED Cinema Display, the latest offering in its line of integrated monitors for the Mac line. The company says its new display features a resolution of 2560 by 1440 pixels and 60 percent more screen real estate than its smaller 24-inch cousin. The design mirrors that of its predecessors, with a 16:9 edge-to-edge arsenic-free glass display on an aluminum stand, with an adjustable hinge to control the screen’s viewing angle. The display also uses the same IPS display technology found in the iMac and the iPad, to provide a 178 degree viewing angle. Apple has also added an ambient light sensor to the automatically adjust the screen’s LED emitter brightness in response to environmental conditions. That joins the display’s other environmental qualifications, such as its toxin-free construction that eschews arsenic, mercury, PVC, and BFRs. It also uses highly recyclable aluminum and glass in building the enclosure. Like many of Apple’s other products, the display has earned EPEAT Gold status and meets the EPA’s Energy Star 5.0 qualifications. The new Cinema Display includes a built-in iSight camera, speakers (with an integrated subwoofer), microphone and a powered three-port USB-2.0 hub, in addition to a universal MagSafe adapter that can charge a connected MacBook or MacBook Pro. You connect computers to the display via the Mini DisplayPort, which transports both audio and video. You'll have to wait to get your hands on the new display: Apple says the 27-inch LED Cinema Display will arrive in September for $999. 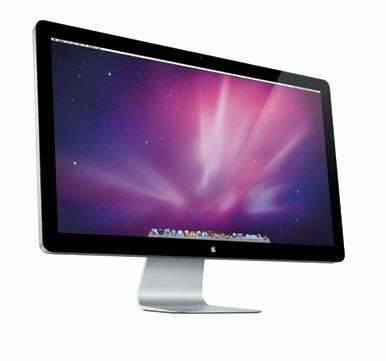 At the same time, this marks the end of the road for the 24-inch and 30-inch Apple displays. According to Apple vice president of hardware marketing David Moody, those products will continue to be sold until supplies run out, at which point the new 27-inch display will be Apple's only standalone offering.